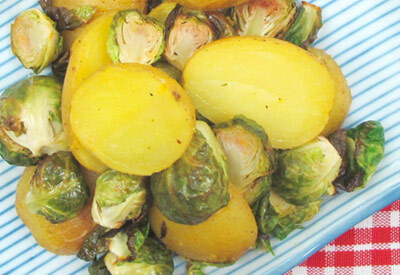 Place potatoes and Brussels sprouts on two large baking sheets. Spray with cooking spray, sprinkle with salt and pepper and toss to coat. Arrange in a single layer, cut sides down. Bake for 20 to 25 minutes or until tender. Drizzle with lemon juice and serve warm.